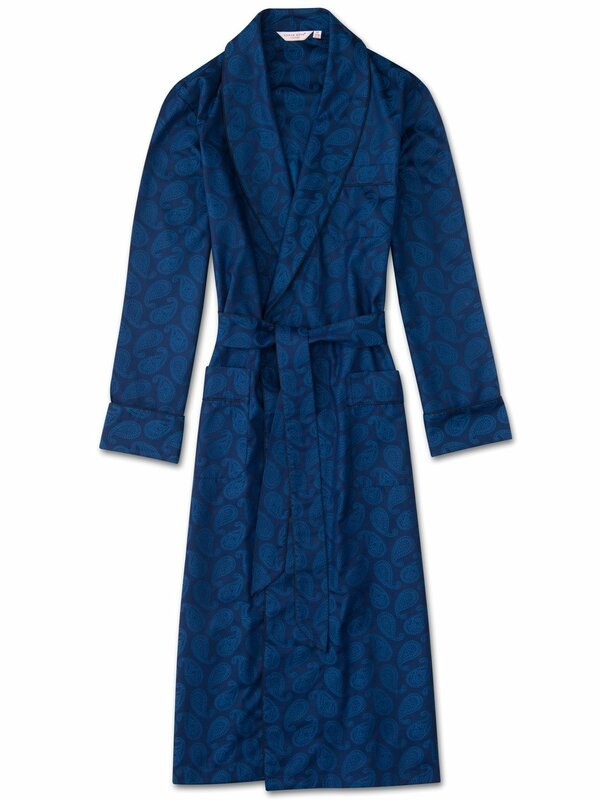 The Paris 13 navy blue dressing gown features a stunning paisley design with our signature rose logo worked into the geometric patterns. This intricate design is woven into a mid-weight fabric using a traditional jacquard technique to produce a layered and textured repeat pattern. With its satin touch, it feels as great as it looks. Made from 100% cotton but often mistaken for silk, the Paris 13 dressing gown features a classic shawl collar design, rifle cuffs, a breast pocket and two front pockets for practicality while around the house. The gown is also complemented with navy piping and a self-fabric tie-waist for an added touch of luxe.